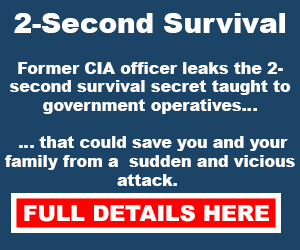 DON'T MISS THIS INFORMATION FROM EX-CIA OFFICER JASON HANSON - IT COULD SAVE YOUR LIFE OR THE LIFE OF A LOVED ONE. It’s my belief that 98% of police officers are good, hard-working, honest people. But, it’s the 2% of police officers that are scumbags and make the news and that all of us need to be careful of.Here’s how to deal with them…First, don’t do anything stupid and don’t be a complete moron (that’s the nicest way I can put it.) People who try and talk-back to the police, or who run from police, or who try and attack the police are always going to end up in a bad situation, even if they were completely innocent when the incident started.So many of the police stories you hear on TV often begin with someone doing something illegal or purposely provoking the cops. However, let’s assume that you’re a law abiding citizen who’s not going to be caught shoplifting or running from police after a drug deal goes south… and that you’re encounter will probably be for a minor traffic violation, like it will for most of us.The truth is, I have a lead foot and I’ve been pulled over many times for speeding (not recently, but often in my youth) so I’ve had plenty of encounters and I can tell you what I believe the average person should do.#1: Use technology to your advantage. When you get pulled over by a police officer he’s not going to immediately run up to your car door. He sits in his car for a minute or so and runs your license plate to make sure the car isn’t stolen and that there is no warrant out for your arrest.While he’s running your tags, take out your cell phone and start recording so you have an audio (or video) of your entire interaction. #2 If you carry concealed like I do, have your hands on the steering wheel when the officer approaches your window. In a calm and respectful manner say, “Officer, I just want to let you know that I have my concealed carry permit and I’m carrying at this time.”Most likely, the officer already knows anyway since almost every state lists that you have your permit when they run your tags.However, it’s still a good idea to do this and it may get you out of a ticket. The places I’ve lived have been Utah and Virginia (gun friendly places) and I’ve never had a problem when getting pulled over while carrying a gun. In fact, the funniest response I ever got was from a state trooper. After I told him I was carrying concealed he said to me, “I’ll make you a deal. If you promise to keep your gun in your holster, I promise to do the same.”I did hear of one incident from a student of mine where the officer acted out of the norm. He told me that he got pulled over for speeding and notified the officer that he was carrying concealed. The officer told him to step out of the car. He then instructed the student to remove his gun from his holster and place it on the trunk of the car. Personally, I would never have agreed to this.I would never have my hands on my gun and remove it from the holster even if asked by police. That’s just a disaster waiting to happen. If I found myself in this position I would respectfully tell the officer that I did not feel comfortable removing the gun but that he or another officer could remove it. (In my opinion, only a knucklehead officer would ever ask you to touch your gun or remove it in their presence. )The bottom line is, always be respectful and bite your tongue when tempted to mouth off while dealing with police. If the officer makes a racist comment or says something bad… sitting there on the side of the road is not the time to get into an argument with them.Instead, once the stop is over, and the officer is long gone, then you can take your audio recording to the appropriate places to let them know what the officer did.If more people had self-discipline and swallowed their pride, they’d have a lot less problems with the police and could take the right action once their encounter was over. These and many more tips are also available on the front page under Jason Hanson, Ex-CIA or also under Secrets of Ex-CIA at www.LeadingEdgeRadio.com - Who reminds everyone that obeying the law saves lives and Police Officers all want to go home at the end of their shifts. Please be respectful and obey the laws. 99.9% of the time, all Police Officers will treat you properly, but for that 0.01% of the time, these tips above just might save your life. The Mailbag From Katharine H: Since this election will likely be the most important in my lifetime, do you have an opinion as to who would be the strongest, most competent leader? A: I still have a lot of research to do and want to learn even more about the potential candidates. But, right now, Ben Carson is the one I like the most and who I think has the value system that is most in line with mine. From Lisa L: Do you have to have a driver’s license to attend the driving course? From Steve L: May I ask, please, if a date (even tentative) has been set for the next driving class? A: All of the driving courses are sold out for the rest of 2015. The next open course is April 22-23, 2016. There are 8 seats left in it. Click here for full details. From Curtis B: What do you think the biggest threat our country faces is? I’d appreciate your take on it, if you have the time. Thanks. A: I don’t think it’s Russia or China or any outside force. I think it’s the U.S. economy and the collapse of the dollar. A major financial meltdown (like Greece) is what I believe is our biggest threat. From Bill H: I often hear commercials on the radio for LifeLock. I was wondering if you would recommend doing something like this or if there are better options to protect my identity? A: I do not recommend this and go into detail why during the Spy Course. Instead, I would just do a credit freeze, which is exactly what I do. About Jason Hanson: Jason Hanson is a former CIA officer and security specialist. He's the founder of Spy Escape & Evasion and has appeared on numerous television shows, including ABC's Shark Tank, Rachael Ray, and The NBC TODAY Show. Jason is also a leading guest on Leading Edge Radio Network. This past Friday morning I was getting ready to teach the Escape & Evasion Driving Experience. As we were setting up, one of my instructors said to me, “Did you hear what happened last night at Wal-Mart?”Well, at about 6:30pm on Thursday evening a couple had just finished shopping and were getting ready to leave the Wal-Mart parking lot. Suddenly, a man jumped into the back seat of the car and pointed a gun at the couple.One of the passengers jumped out of the car and the gunman then jumped out of the car too. The gunman fled to a getaway vehicle being driven by his buddy. As the gunman was driving off police say he fired at least one shot at the couple’s vehicle. Thankfully, the couple wasn’t hurt, but police have yet to catch the gunman and his accomplice.As happens anytime a crime like this occurs in a more quiet place people were saying, “I can’t believe this happened in our town… I never thought this type of crime would happen here.”I always laugh every time I hear this after an incident because it’s not as if someone is going to say, “Yeah, my town is a real dump. I’m not surprised there was a carjacking, I’m just surprised they don’t happen daily and that I didn’t get murdered last night.”My point is, never forget that it can happen anywhere and anytime… even in your town, your neighborhood, or your driveway. That’s why I want to share with you 3 quick tips that could save your life if you ever find yourself in the situation where someone is in or is trying to get into your vehicle. Tip #2- Remember that car doors are not bullet proof. In other words, if a criminal pulls a gun on you and you happen to have a gun, you can shoot straight through the car door and you don’t have to raise your gun where they can see it before you shoot.It doesn’t matter if you’ve got full metal jacket rounds or jacketed hollow-point rounds. This could be a huge advantage to you since you don’t have to waste precious time and raise your gun up to the window to fire. Tip #3- Understand deadly force law. If you are in fear for your life you can run over the criminal with your car. So, if some guy walks in front of your car and points a gun at you, you don’t have to sit there until he makes his next move.You can jam down on the gas pedal and get away to safety. It is the same thing if you look in your rear view mirror and someone is blocking your vehicle while pointing a gun or knife at you. When your life is in immediate danger you are allowed to preserve your own life, even if it comes at the cost of the attacker’s life. SPECIAL NOTE: If you would like details on the next Escape & Evasion Driving Experience where we teach gun disarms, knife disarms, and how to stop a carjacker, click here before it’s sold out. The Mailbag From Carlos R: I’m a big fan of you and your work and, even though I don’t always agree with you, I think you do great work and service.A: I appreciate your honesty. We don’t always have to agree with people to learn from them. From Jeff F: Hey Jason, I bought your book on starting an FFL for retirement. I have thoroughly enjoyed it but I did have one question for you. I am a chiropractor and I am at the office more than I am at home. I always have a staff member in the office to answer phone calls and sign for packages and such. Is it ok for them to occasionally sign for any packages if I use the office as my mailing address? From Jonathan S: I’m curious on how you got recruited into the CIA? I have a passion for espionage and have wanted to be a “spy” my whole adult life. Is there any light you could possibly shed on this with me it would be greatly appreciated. A: I’m going to let you in on a huge myth created by Hollywood: the vast majority of people are not recruited into the CIA. Instead they simply apply for the job and go through the rigorous hiring process, which is what I did. So, if I were you, I wouldn’t wait for a recruiter to approach you, instead I would put in an application. From Dave P: The KLR650 is my deeply considered bug out bike… I live in Northern Virginia and was here on 9/11. My (now ex) wife was working in Crystal City near the Pentagon that morning and when the second plane hit the Twin Towers… It took her NINE HOURS AND FORTY-FIVE MINUTES TO GET OUT OF HER PARKING GARAGE. A: A huge reason to consider a survival motorcycle for a crisis situation. P.S. If you haven’t attended the Escape & Evasion Driving Experience yet, click here now. About Jason Hanson- Jason Hanson is a former CIA officer and security specialist. He's the founder of Spy Escape & Evasion and has appeared on numerous television shows, including ABC's Shark Tank, Rachael Ray, and The NBC TODAY Show. This Week: Items you need for a crisis and what to do when it happens… A good rifle if you can’t own an AR… How to make extra income selling guns… And, a nasty picture of a knife cut. This past weekend, I held the Advanced Survival Tradecraft course in Las Vegas, Nevada. This is a special course I hold once a year that covers covert entry methods, advanced lie detection, hostage avoidance, home defense measures based on CIA safe houses, and a whole lot more. One of the things discussed is what you should do when the crisis hits. In other words, if you’re at work when a terrorist attack or a terrible natural disaster occurs, what should you do to get to your family? The first thing you want to do is go get the youngest and weakest members of the family. For me, this means going to school and getting my kids and you want to get the youngest child first. So, if you had a child in pre-school and a child in 8th grade you would go pick up the pre-schooler first. Also, you and your spouse would both be going to pick up the kids. In a crisis event, you hope for the best but always assume the worst. So, I have to assume my wife is dead and that I need to go pick up the kids. My wife has to assume that I am dead and that she’ll have to go pick up the kids. Whoever gets to the first child leaves a note for their spouse. This is critical to do. In the bag in my car, I have some Rite in the Rain paper and an Inkzall marker. This marker can write on all types of wet and oily surfaces. I also have Gorilla tape to tape the note to the pre-school door or in some other easy-to-see place. Once you have gotten your kids then you head home or to the designated place you’re supposed to meet the rest of your family (have two of them.) Obviously, if your home or first designated meeting place is no longer standing or safe to enter then you’ll go to the secondary meeting place, which can be a church house, random parking lot, or park. And if the secondary meeting place isn’t safe you’ll go to the third place. This is an incredibly simple plan that I recommend you talk with your spouse about tonight. In a true disaster, the chaos is going to be extreme and you’ll be grateful you know exactly what to do and the places to meet your loved ones. Plus, don’t forget the paper that writes in the rain, the Inkzall marker, and the Gorilla tape.